Juicy peaches. Ripe, luscious peaches. Peaches and August just go together for me---one always brings to mind the other. I love peaches plain, eaten out of hand. I love peach chutney. I love grilled peaches. And peach ice cream is a concoction worthy of heaven. But my favorite is peach cobbler. Marry the peaches and spices together with a bit of thickener, so the juices are not runny but not set firmly. Add a squirt of lime juice, for a bit of brightening of the flavors. Be liberal with the struesel topping, with chopped pecans, of course. Bake it (preferably in an Aga!) until it bubbles nicely and the topping is browned and crunchy. I'd show you the finished product...but we ate it. Yummmmmm I love peaches but we don't get many here. They have to be imported from southern states. I learnt what an Aga is today. I had never heard of them before. 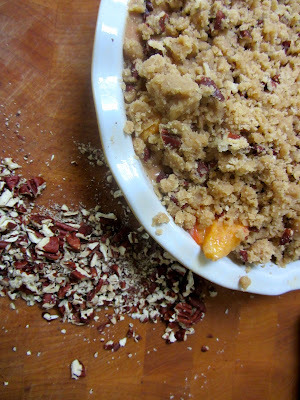 When I make a crumble I usually add oats to the topping.